When it comes to healthcare, the patient experience is always a top priority. Organizations must coordinate a variety of services from room cleaning to patient transport fast and efficiently. Methodist Le Bonheur Healthcare (MLH), the largest healthcare system in Memphis, Tennessee, relies on MongoDB to make this happen. We connected with David Deas, MLH’s Corporate Director, Innovation and Knowledge Analytics, to learn more about their MongoDB-powered hospitality application. Methodist Le Bonheur Healthcare (MLH) was founded in 1918 and is the largest health care system in Memphis, consisting of six hospitals and dozens of smaller facilities and clinics, with nearly 14,000 employees. Our biggest hospital has over 400 beds and operates at near-capacity on a regular basis. Why did you start using MongoDB? Coordinating hospitality on a continuous schedule requires dozens of people to ensure the patient remains as comfortable as possible during their stay. Historically, we have been using a legacy, relational database system to manage the flow of patients in, out, and around the hospital, and it was on its last legs. When the time came for a new license and a software upgrade, we were hit with a $1.6 million price tag, which gave hospital administrators some pause. Can you explain how Melodi Flow works and how it uses MongoDB? 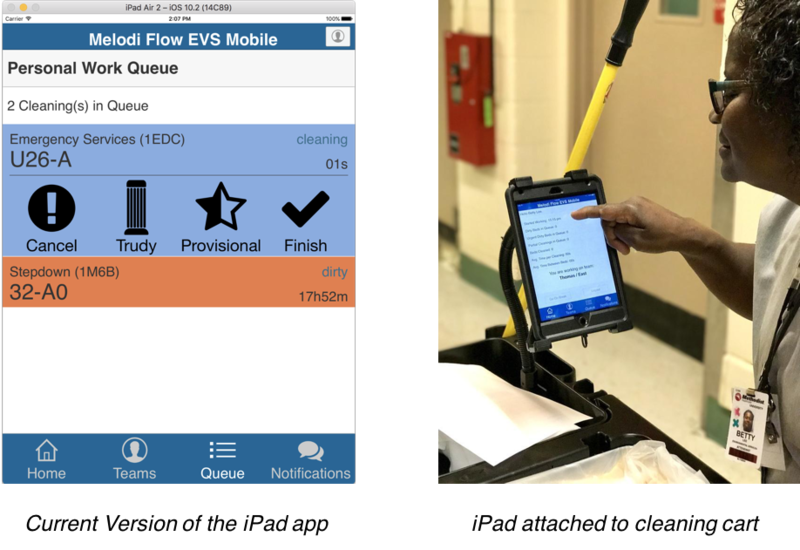 Melodi Flow gives the central dispatch office a real-time master view of every room, along with the status of room cleaners and patient transporters. Unlike with our legacy relational system, using MongoDB ensured that there was no delay between status changes, requests, and raised issues. And those antiquated pagers carried around by room cleaners and patient transporters? Replaced by brand new iOS devices with custom mobile apps to easily manage the daily workflow. 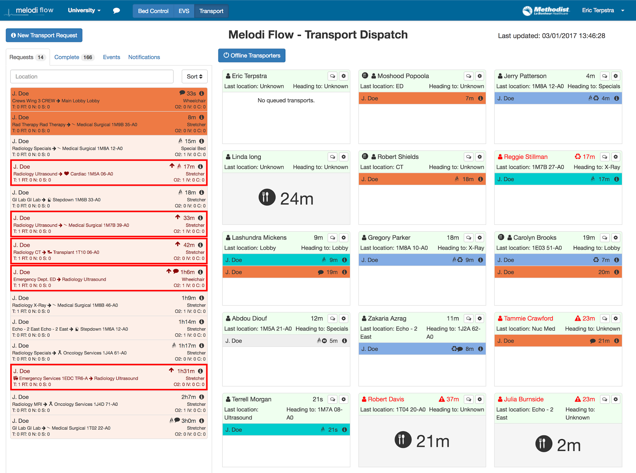 The real-time capabilities of the new Melodi Flow system are powered by reading updates directly from MongoDB's replica set oplog by connected browsers and mobile clients. The real-time aspect of the new system is a huge win, but an additional, not-so-obvious differentiator is the mountain of data being collected each and every day. Every interaction, from acknowledging reservations, to a completed room cleaning, to fetching a patient for daily treatments is recorded for later analysis. We are confident in MongoDB Enterprise Advanced. Replica sets give us peace of mind for resilience and performance, and backups are a breeze. Since we designed our schema with reporting in mind, we can spend less time worrying about complicated JOINs and sub-queries, and more time analyzing our data. After only a few weeks of use, we’ve already examined patient complaints, identified peaks, valleys, and bottlenecks in patient flow throughout the day, and created the beginnings for benchmarking employee performance. What’s next for Melodi Flow? MongoDB has been a crucial tool in managing one of the busiest hospitals in Memphis. Its utility will only grow as the Process Improvement & Innovation team continues delivering solutions for improving patient care.